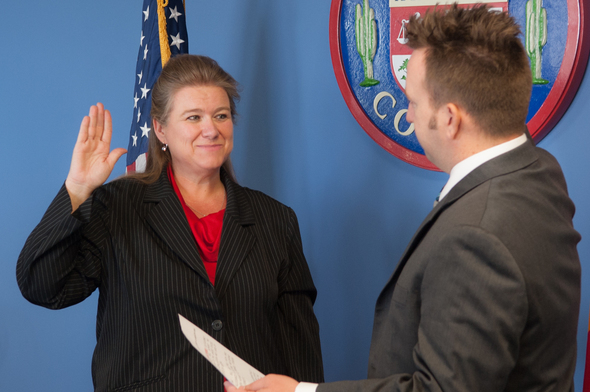 (Phoenix, AZ) - Wednesday, Maricopa County School Superintendent Steve Watson appointed and swore-in Kathy Lynn McNamara to the Liberty Elementary School District Governing Board. McNamara joins the board to fill the vacancy that occurred when Kelly Olson-Stewart resigned her seat on March 8. Statutorily, the County School Superintendent has the option of appointing a replacement member to fill a vacancy on a governing board and the Maricopa County Community College District governing board (A.R.S. § 15-302 and § 15-1441) or in calling for a special election. Kathy McNamara joins the governing board as a longtime resident of the West Valley community bringing with her a wealth of knowledge, experience and service in the area of business and organizational development. McNamara and her husband have three children who have attended or are currently attending LESD schools. “Having three children with three very different educational needs I understand the diversity that is required to provide services that will actually achieve the status of world-class education,” McNamara noted during the appointment process. Today’s appointment follows a newly revised process implemented by Superintendent Watson in which several additional criteria are evaluated leading up to a final appointment. The Superintendent is committed to filling vacancies as quickly as possible rather than following the prior quarterly appointment schedule. During the Liberty ESD process, Superintendent Watson received three names from the governing board but also considered two additional members that included personal interviews with each candidate. Maricopa County is home to 58 traditional public school districts of which there are 276 governing board positions. In 2016, there were 17 vacancies. For more information, contact MCESA Director of Communications and Learning Systems at laurie.king@mcesa.maricopa.gov or 602-372-3704. Above: Maricopa County School Superintendent Steve Watson swears-in Kathy McNamara to the Liberty Elementary School District Governing Board. 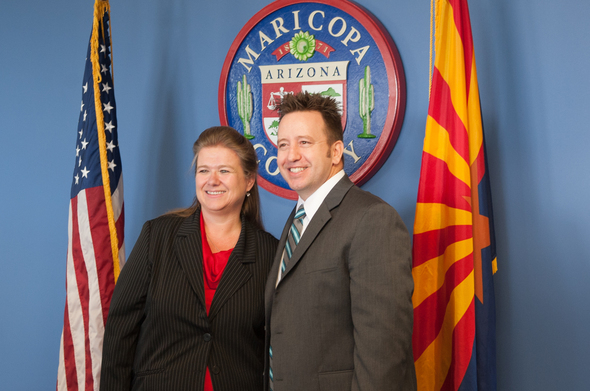 Below: New Liberty Elementary School District Governing Board member Kathy McNamara and Maricopa County School Superintendent Steve Watson.